The art form of the silent comic book is difficult to master, but when done well, the experience of reading a comic without words is deeply rewarding. Building a deep, satisfying story without dialogue requires a confident creative voice and a strong handle on visual storytelling fundamentals, and Gael Bertrand shows that he has both in the new hardcover graphic novel A Land Called Tarot. Inspired by the imagery and themes of the tarot as interpreted through an artistic lens that blends high fantasy, sci-fi, and industrial elements, A Land Called Tarot is one of the most gorgeous books published in recent memory. Plot isn’t Bertrand’s top priority with this project, which instead focuses on immersing readers in a lush, constantly changing environment and evoking the specific feelings that come with each shift in the setting. Bertrand has extensive experience as a video game designer, and that comes through clearly in his work on A Land Called Tarot. It’s easy to see this book as the blueprint for an engrossing action-adventure game, and Bertrand has put an astounding amount of detail into the character designs, props, and environments to immediately pull readers deep into this world. 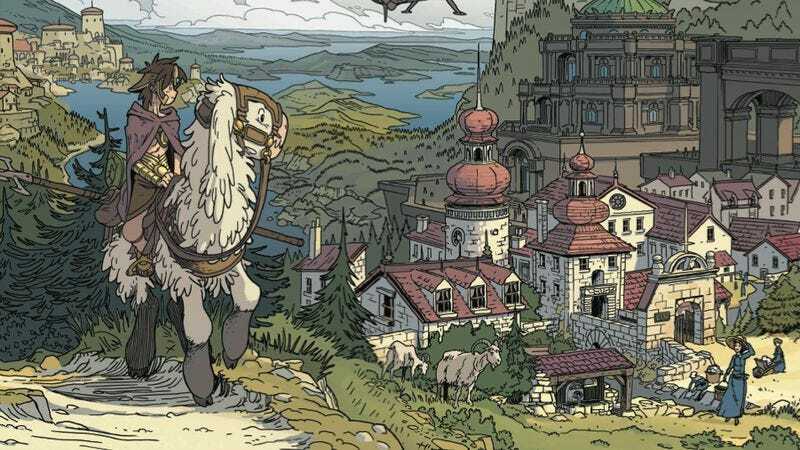 Bertrand creates an astonishing sense of place, beginning with the very first two-page spread of the unnamed lead hero and his animal companion riding past a gothic village overlooking a vast landscape of mountains and lakes. The architecture is the spotlight of that image, but the two-page spread that immediately follows shifts gears to showcase Bertrand’s bold creature and character design with a group riding a giant beetle while dragons soar above them. Bertrand’s art style is a blend of influences from comics and video games. The sweeping vistas and bold character designs are immediately reminiscent of the work of Akira Toriyama, original artist for Square Enix’s Dragon Quest series and creator of Dragon Ball, but there’s also a lot of Moebius and Hayao Miyazaki in there as well. These are all masters of their craft, and Bertrand has learned all the right lessons from these creators. There’s an undeniable sense of wonder and discovery on nearly every page, and you can feel Bertrand’s delight in creating this world and revealing new facets of it to the reader. A Land Called Tarot is lovingly crafted, and the book’s second chapter functions as an appreciation of the art of world-building as the hero melds minds with the kingdom’s frog magician and is thrown into a virtual setting where they make an entire environment emerge from the plain white ground. The three chapters are all named after tarot cards (“La Maison Dieu,” “Le Bateleur,” and “L’Hermite”), and Roman numerals associated with different cards also appear throughout the book to clarify the meaning of certain visuals. This requires some work on the part of the reader, but it also makes for a more interactive reading experience. As someone with very little knowledge of the tarot, I enjoyed looking up these words and numbers to gain a better understanding of how specific tarot cards function as symbols in Bertrand’s narrative. Just as the cards have multiple interpretations, their symbolic value in A Land Called Tarot is subjective to the reader’s perspective. Bertrand provides the pieces, but it’s ultimately up to the reader to put them together, which is challenging but also very gratifying. The first chapter follows the hero and his furry friend as they make their way to a tower that transforms into a giant stone mecha, and the hero’s mission is to deactivate the mecha and take out the king that resides underneath the tower. (That’s my personal interpretation of events, and other readers may glean something different from it.) The second features the aforementioned conjuring of an entire virtual world, but begins by giving readers a stronger sense of the kingdom and it’s decadent design. Both of these chapters contain exhilarating action sequences; the first has the mecha tower’s transformation and subsequent collapse, and the second has a vicious dragon that emerges in the virtual world and attacks the hero. Color plays a huge role in the storytelling, establishing the mood for different settings while also drawing the eye to important elements on the page. The broad range of colors heightens the fantasy, and Bertrand’s delicate rendering adds texture and dimension but never detracts from the sharpness of the linework. There are images in A Land Called Tarot that elicit audible reactions because they are just that breathtaking. After finishing the book I wished it was a video game so I could spend even more time in this world, exploring every hidden corner and meeting every background figure, each one given as much attention in its design as the lead characters. The final chapter of A Land Called Tarot is the most ethereal, with the hero meeting the angelic embodiment of Temperance literally ascending to a new plane of enlightenment. This chapter features one of the book’s coolest transitions as the hero looks at a bowl of liquid he has just drank from, and sees a swirl in the liquid. That swirl becomes a spiral-shaped canyon, and Bertrand zooms into that landscape, where the hero emerges from the pool of water at the bottom of the canyon. After encountering the angel and turning his staff into a caduceus, the hero gains wings on his feet and soars into the sky, beautifully illustrated with clouds that have no ink outlines, just planes of creamy colors that create fluffy, soft shapes. The visuals create a strong impression that the hero is gaining some sort of transcendent knowledge, and the ambiguity of the narrative fits well for the idea that this is a more heightened sense of perception that is beyond what the reader understands. It’s knowledge in the form of color, shapes, pattern, and even a bit of music, and while we don’t know what exactly the hero is experiencing, it’s clear that this is a revelatory moment for the character. A Land Called Tarot is the latest collection of work previously serialized in Image’s exceptional Island anthology, which spotlights a huge array of voices from around the world and gives them the opportunity to do whatever the hell they want. Three other Island stories have been collected, and they are all fascinating, engaging reads that try something exciting and different with the medium: I.D. by Emma Ríos (co-curator of Island with Brandon Graham) was the first to see release, a psychological drama about three people that engage in an experimental body transplant procedure to escape their problems, drawn in Ríos’ signature fluid style. Simon Roy’s Habitat is a gritty sci-fi adventure about a security officer who discovers a secret that could save his collapsing home environment, with intelligent, distinctive designs and a story that will appeal to fans of Roy’s Prophet. Matt Sheean and Malachi Ward’s Ancestor is the most surprising of these first collections, beginning as an Ex Machina-esque technological allegory before evolving into a cosmic exploration of existence that reads like a Jack Kirby acid trip. Island regularly features innovative, compelling work, and its anthology format means readers can jump in at any time and find something interesting. The serialization of certain stories may make it confusing at times, but there’s also something fun about entering a story in progress and discovering what the creators have already built. Not all of these serialized stories are accessible to new readers, but A Land Called Tarot’s individual chapters certainly are, inviting readers into a fantasy world full of surprises and built with impeccable craft. Island is one of the most thrilling comics every month, and hopefully readers who enjoy these collections will seek out the source anthology and keep it alive.